your Father’s Day cards were wonderful and will be so appreciated! for our heroes to send home to their family and friends! please visit her blog Crafty Colonel. Thank you Donna for sharing your awesome creativity with us! Great challenge...Thanks for the inspiration, Donna! Gorgeous card, Donna! Thanks for the inspiration! Beautiful card Donna, thank you for being our sample card maker this challenge! I love the stamped buttons and your choice of colors! This card is stunning! Simply stunning! Great colors and I love your card, Donna. Just beautiful. Wonderful idea with your buttons. 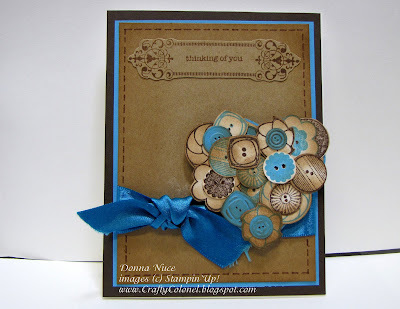 Donna, your card looks amazing with all those buttons and great colors!! I'll have to play along with this one as I love those colors together!